Basic Functions of the Nexus 6P? 1. Home screen manipulation. Beyond just adding app shortcuts, we can't seem to add more home panels. Normally we would try and make one by dragging an icon to the right of the screen, but it won't work, we can't add new empty panels. How does one do it here? 2. Calendar widget. We can make the calendar in the app show up in a month setup, but the widget won't changes to such a view. My phone has the S Planner which is what she wants, although I know S Planner is only on Samsung phones. Can the Calendar widget be changed from an "important events" look to a month look? If not, which widget is recommended to work like S Planner would? 3. The Google bar on the top of the home panel, as well as the whole Google panel when you swipe to the leftmost panel. She wants those gone, if at all possible. Can they be removed? 4. Contacts. She would like to move the contacts from the device to the SIM card, if at all possible. We can find the option to import from a SIM card, but we can't find the option to export them to the SIM card. How does one do this on this phone? Those are her issues. If anyone can direct us how to do these, it would be greatly appreciated! First, when talking about the 6P, try to avoid the word "bending". 1. I can have as many as 4 home screen panels, including the Google Now "page". If you want additional, you'll need a launcher such as Nova, which will also resolve at least part of #3. 2. It does not appear that the stock calendar widget will do what you want, you might need to explore 3rd-party calendars that will connect to the Google account. 3. Only with a 3rd-party launcher. 4. What is the fascination with saving contacts to SIM cards? If you lose the phone, contacts are gone. Once the contacts are on the phone, they can't be changed to a different save location. For example - if the contact was created as a "Google" contact, you can't go in to edit mode and make it a "SIM" contact. In fact, my 6P on Verizon won't allow me to create a contact that doesn't sync to an online account, not even locally on the device. If the contacts are created on the Google account, any subsequent devices that account is signed in to will then have those contacts as soon as they sync. How does one add more home panels (without 3rd party apps), though? We tried, and it won't add any others, and it's stuck with just the original home panel and the Google panel. We can't find the ability to add more panels, such a dragging an icon or widget to the right of the screen where it should cause a new panel to appear and be able to drop it on that. It seems like it's locked to just the two panels at the moment. Any recommendation for a 3rd party calendar that matches what she wants much like S Planner does for me? And I think she wants to be able to save contacts to the SIM card so then when she gets new phones in the future, all she does is plug in the same SIM card and all her contacts will appear automatically. Though, that's only if it can be done, she's not above just copying everything from scratch. See the attached screenshot, I'm holding the app icon and have dragged it to the far right of the screen, see the edge of a box on the right edge of the screen and the + on the row of dots indicating what screen I'm on? That's indicating it'll create a new screen. As for the contacts, syncing them to a Google account (which is the ONLY way to create contacts on the 6P as it turns out) will make them all available on new devices once the Google account is signed in. Yeah, that's what we've tried doing, and I'm trying it again right now. That doesn't appear on her phone and it does not allow a panel to be added. It's really weird. Is there a good 3rd party app to override this for her so she can get multiple home panels? Yes you should try Nova Launcher, it is very customizable. There are also plenty of YouTube tutorials if you need. I use a calendar app called month it allows a full month widget. For a calendar app, I just switched to DigiCal and cannot recommend it enough. It does just about everything you could want. This Nova Launcher, I'm not too familiar with it, or any launcher. I assume it's going to start the whole OS in a different way. Will this give her 6P the things she desires without drastically changling the look and feel of the default OS? Does the phone need to be rooted? Forgive the abundance of questions, she's fairly picky on how she wants this phone to work for her. No need to root. It doesn't START the phone in a different way, it's akin to a skin like TouchWiz on Samsung devices, though it doesn't go quite as deep into the OS. Yes, it will look a little different but it's entirely customizable. The Pro version (has more features) is only $1 on the Play Store right now, might want to grab it so you can get the full array of options. It's really weird that you can't add a new home screen. I currently have 7 including the Google one and can add another using the method you are trying. If she ends up not liking Nova, you may want to try a reset cause that sounds like a software issue and is not something that can be enabled/disabled as far as I know. And unless she plans on switching to a phone with a different OS in the future (an iPhone) you pretty much have to log into a Google account when you first start the phone which means your Google contacts sync automatically anyway. Even if she is planning on changing OS's frequently, Google will store them accross platforms. You also have the problem (though I personally wouldn't call it a problem) where that is the only way to save them on a 6P. As for Nova launcher, all it does is change the look and feel of your home screen. All menus, settings, transitions, etc will continue the same way they have been on Marshmallow. The only thing that will be different is what you are shown when you hit the home button. Contacts. She would like to move the contacts from the device to the SIM card, if at all possible. We can find the option to import from a SIM card, but we can't find the option to export them to the SIM card. How does one do this on this phone? Absolutely no need for this. If contacts are created as Google contacts, they're available to edit on any web browser (even a PC's), and they can't be lost. If the reason is to 'keep them if you move the SIM card', Google contacts already sync with any new devices - Android or iOS. Plus, if contacts are on the SIM card and the phone is lost or stolen, all that contact information is gone for good. There is *no* reason with modern phones to keep contacts on the SIM card. Nova did it, she can now customize it the way she wants. She just needs to decide on a calendar app, and do something about her contacts besides the SIM. Thanks to everyone for their patience in helping us out with this, she will take care of things from here! 4. simply sync your contacts in google cloud. Short of that, simply export them all to your computer, then import them to the new phone. and do something about her contacts besides the SIM. What's wrong with using Google? Is there any specific reason she seems so incredibly reluctant doing so? I've had as many as 8 home screens. I continually use the add to home screen for websites I want to go back to at a later time, plus I used to have a few large widgets. When dragging icons to the right to create a new home screen, you also have to drag it until you see a white bar on the right side of the screen, and after like a half second it will jump to the right and you can place the icon on the newly created home screen. And like others have stated, you are no longer able to have numerous blank home screens. Once you pull the last icon from a home screen panel, it goes away. EDIT: I just did a little test. Using the webpage shortcut icons to create new home screen panels, I had 12 panels including the Google Now panel and the primary home screen. I probably could've kept going but I ran out of icons. Something to note, you can keep mostly blank panels up, but there has to be at leat one icon to do so. 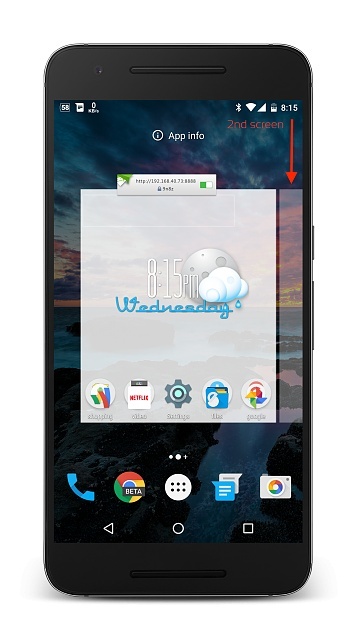 With this launcher, you can have an endless number of home screens with as few as one icon each. Just add an icon to the last screen then grab hold of it and drag it (fully!) to the right edge of the screen. I suggest you grab the left edge of the icon as you need to get the icon at least 50% off the right edge of the screen. A new homepage will appear upon which you can now drop the icon. 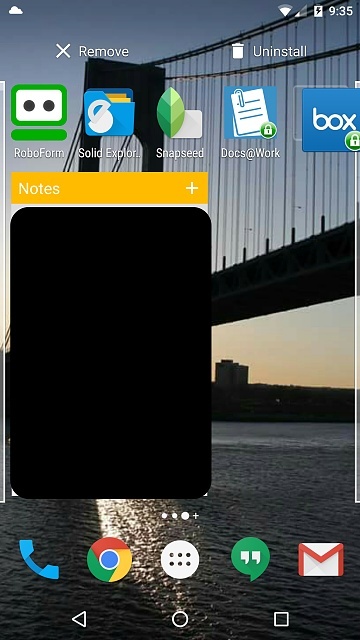 To rearrange home screens, first long-press a blank area of any home screen. Your current home screens will open in a sort of filmroll. Scroll left or right to the screen you wish to move, long-press on it and drag left or right to its new location then let it go. Thanks. I realized my mistake, I was trying to drag the only icon off the last screen I had in order to make a new one. Obviously that won't work. What is the stock app called Preset?